Traditionally, for one weekend in September, all the museums and other institutions of state heritage in France are open to free and guided visits. Additionally, during these two days, Strasbourg opens the door of all the European institutions and offers all curious visitors a free tour. Christmas owes a lot to Strasbourg. To begin with, the very tradition of decorating a Christmas tree started in Alsace. Furthermore, Strasbourg celebrates Christmas with one of the biggest, oldest, most appreciated and one of the most beautiful Christmas market in whole of Europe. This annual manifestation offers visitors a free night entrance to all of the city museums with lot of different activities for art lovers of all ages. It also provides a new vision of museum exhibitions and a really unique atmosphere in the city. This annual festival which lasts for ten days all through the France provides cinema lovers with reductions on all films showing at all the city cinemas at that time. Search for the movies that are shown with French titles (films with mark VO) and be a part of passionate audience. This festival created in France in 1982 is dedicated to music, musicians and music lovers who, during the whole day, can enjoy in free concerts all around the town. During this summer day, one can find professional or amateur musicians playing rock, folk, jazz, hip-hop, cabaret, classical or electronic music on literary every street corner or square. The celebration lasts whole day and must not be missed! Traditionally, summer nights in Strasbourg are something really special. During the whole July, visitors can enjoy light decorations that give a new vision of city buildings, fountains and churches. 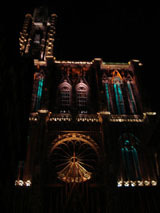 Accompanied with music, these light shows (especially the play of lights on the city Cathedral) are a unique experience of urban space and a great tourist attraction. Throughout the whole France, the National Day that commemorates the fall of the Bastille and the beginning of French Revolution is celebrated with great fireworks. Strasbourg is no exception - on this day, be prepared to find your spot in the city centre and to witness a unique firework show.